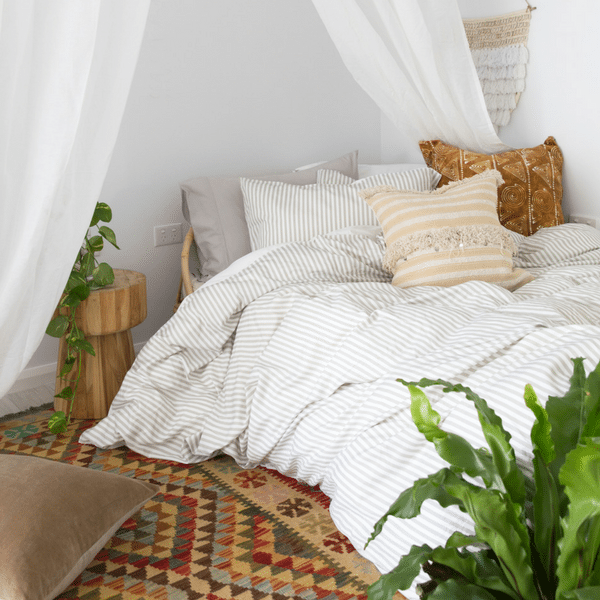 Our much loved 100% Bamboo Double Sided Grey & White Striped Doona Cover is certainly a crowd favourite – To help you get styling we have put together some inspo for styling our luxe stripes! Zach (@zachmilne) showing us how it is done in this open, clean space! Cushions really are our stripes best friend! Stripes in Lisa’s (@lisadanielle_) airy bedroom matched with our 100% Bamboo Summer Quilt in Pewter. Chelsea (@chelsloth) dressed her palled bed in our stripes & paired them perfectly with a gorgeous mandala wall hanging from Jaipur Art Factory! The gorgeous Summah (@summahtaylor) showing off the benefits of our Double Sided Doona Cover Set by displaying the White side of her Doona Cover & Striped Side of her Pillowcases! Feeling inspired? I know we are! CLICK HERE to check out our 100% Bamboo Double Sided Grey & White Striped Quilt Cover Set & get the look! Don’t forget to post a pic of your styled Striped set and tag us on Instagram @yohomeau & #yohomeau – We love to see what you can create! Check out our Pinterest for more Styling Inspo!